Its five members are appointed by the Norwegian Parliament. In his will, Alfred Nobel tasked the Parliament of Norway with selecting the winners of the Nobel Peace Prize. At the time, Norway and Sweden were in a loose personal union. Despite its members being appointed by parliament, the committee is a private body tasked with awarding a private prize. In recent decades, most committee members have been retired politicians. 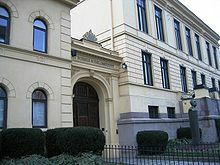 The Norwegian Nobel Committee is assisted by the Norwegian Nobel Institute, established in 1904. The committee might receive well more than a hundred nominations and asks the Nobel Institute in February every year to research about twenty candidates. The director of the Nobel Institute also serves as secretary to the Norwegian Nobel Committee; currently this position belongs to Olav Njølstad. Kaci Kullmann Five had been the Norwegian Nobel Committee's leader since March 2015. Berit Reiss-Andersen (chair, born 1954), advocate (barrister) and President of the Norwegian Bar Association, former state secretary for the Minister of Justice and the Police (representing the Labour Party). Member of the Norwegian Nobel Committee since 2012, reappointed for the period 2018–2023. Thorbjørn Jagland (born 1950), former Member of Parliament and President of the Storting and former Prime Minister for the Labour Party, current Secretary General of the Council of Europe. Chair of the Norwegian Nobel Committee from 2009 to 2015. Currently regular member. Member of the Committee since 2009, reappointed for the period 2015–2020. Asle Toje (born 1974), foreign policy scholar. Appointed for the period 2018–2023. ^ a b "Excerpt from the Will of Alfred Nobel". Nobel Foundation. Retrieved 14 June 2009. ^ a b c Arntzen, Jon Gunnar (2007). "Nobelprisen". In Henriksen, Petter (ed.). Store norske leksikon (in Norwegian). Oslo: Kunnskapsforlaget. Retrieved 14 June 2009. ^ a b Helljesen, Geir. "Bare nordmenn i Nobelkomiteen" (in Norwegian). Norwegian Broadcasting Corporation. Retrieved 14 June 2009. ^ Dahl, Miriam Stackpole (10 October 2008). "Fredspriskuppet". Ny Tid (in Norwegian). Archived from the original on 10 December 2008. Retrieved 12 December 2008. ^ "The Norwegian Nobel Committee". The Nobel Peace Prize. Retrieved 3 October 2018. Heffermehl, Fredrik (2008). Nobels vilje (in Norwegian). Oslo: Vidarforlaget. ISBN 978-82-7990-074-0.